Robert H Porter has been a William R. Kenan, Jr. Professor at Northwestern University since 1993. He received his BA from the University of Western Ontario in 1976 and his PhD from Princeton University in 1981. He previously was a faculty member at the University of Minnesota (1980-1984), Bell Laboratories (1982-1983), State University of New York at Stony Brook (1984-1987), and Bell Communications Research (1986-1988). He has been a visiting professor at MIT, Chicago, Boston University, UC Berkeley, UCLA, and a visiting researcher at LEI, CREST-INSEE. Porter has conducted research on theoretical and empirical studies of collusion, price wars, and bidders’ behavior in auctions. One of his influential papers presented a model of noncooperative collusion to explain the instability of prices over time as a result of stable collusive behaviors. Based on this, a test for distinguishing collusion from competition can be constructed. He also analyzed bidding rings in the procurement auctions and performs empirical tests for collusion. In addition, his work provided a framework to empirically distinguish alternative auction models. 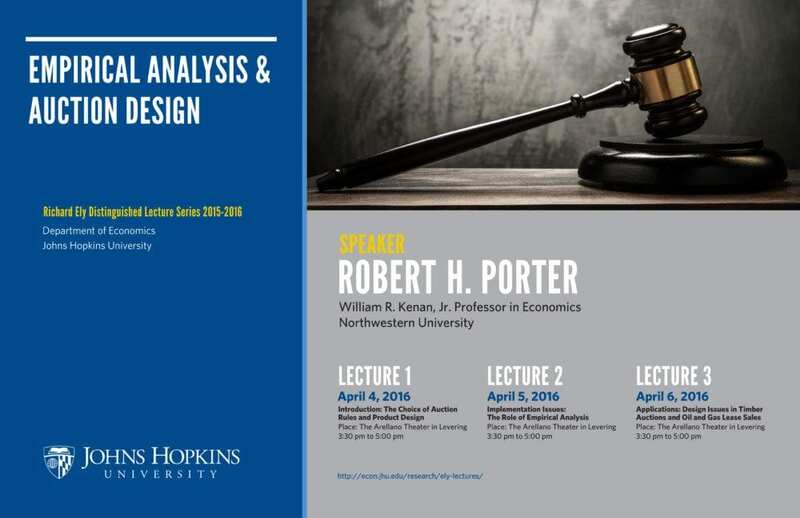 Porter’s work has led to many empirical works that detect collusion or measure market power. Consequently, his work has had a significant impact on competition policy. Above all, the practice of detecting cartels has been largely influenced by his work. Porter is a fellow of the Econometric Society and of the American Academy of Arts and Sciences, and the 2009 Distinguished Fellow of the Industrial Organization Society. He is the president of the Econometric Society in 2015. He is a former co-editor of Econometrica, the RAND Journal of Economics, American Economic Journal: Microeconomics, and the Handbook of Industrial Organization.